Additional Information: Can be found all around Taiwan, at lower elevations, in grassy and hilly areas. Poisonous though generally not aggressive. 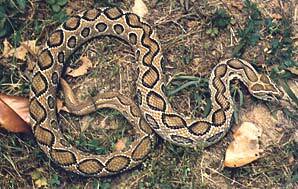 Distinguishing Features: Large brown or light coloured snake with dark diamonds/triangles. Additional Information: Highly poisonous. More rare than before; is more commonly found in southern parts of Taiwan. Found below 1300m in mountains, forests and bamboo groves. Distinguishing Features: Brilliant green body, with a reddish head and tail. Triangular head. Additional Information: Primarily nocturnal. Most commonly found in trees and bamboo groves. 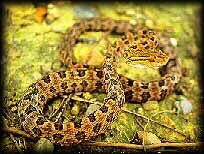 Taiwan's most common poisonous snake, found under 1000m. Can be dangerous to bikers as it often strikes from trees. Distinguishing Features: Black body with white bands from head to tail. Round head. Additional Information: Can be found all over Taiwan at lower elevations, commonly near water and rice paddies. Excellent swimmer. Serious bites can cause death within two hours if not treated. Primarily active at night. Distinguishing Features: Odd looking snake with large head. 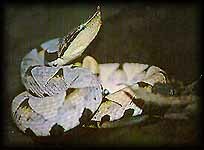 Brown with numerous black spots. Additional Information: Can be aggressive, attacking shadows and moving objects. Found all over Taiwan at lower elevations, near water and in forests. Distinguishing Features: Brown body with black/yellow diamonds running down the back. 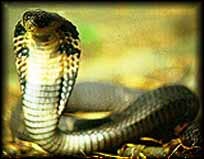 Additional Information: Worldwide, this snake is believed to be responsible for more human deaths than any other snake. It is irritable and can strike very quickly. Found in forests and grasslands. © Formosan Fat Tire Association 2000-2011. All rights reserved. Site design by Dennis Flood.